Still fantasizing about moving abroad? We all know that the ideal thing to do is stay in your country of birth and work towards making it a better place. But sometimes, when you're stuck in traffic, or the headlines are inundated with news of politicians' latest shenanigans and minors getting murdered, it's nice to imagine living in a country where things just work: where your taxes actually go towards free education and healthcare, where the rule of law is followed and you can commute with dignity and not worry about your kids being illegally searched by the police. In case you'd like to further indulge your fantasies, here's how you can immigrate to some of the happiest, most peaceful countries in the world. Assuming you aren't willing to learn Icelandic, Norwegian, Danish or Dutch, we've limited this guide to English-speaking nations. Generally speaking, the most feasible way to become a permanent resident is to first get a work visa. While studying in your desired destination does increase your chances, either way, you'd still have to get a job to become eligible for permanent residency. The visa application processes of Australia, Canada, and New Zealand are pretty similar: you have to be invited by immigration to apply for a work visa. To be considered for an invitation, you need to submit an Expression of Interest (EOI) form through the immigration website, and whether you'll be accepted into the pool of candidates depends on whether you reach the minimum required score on their points test. The number of points you're awarded will depend on factors like your age, occupation, educational attainment, and marital status. Getting into the pool doesn't necessarily mean you'll be invited to apply, and being invited to apply doesn't guarantee that you'll get a visa. That said, if your line of work is relevant to what they're looking for and you can afford the application fees, it's definitely worth a shot. The land of Middle Earth, where even the sheep look perfectly content. 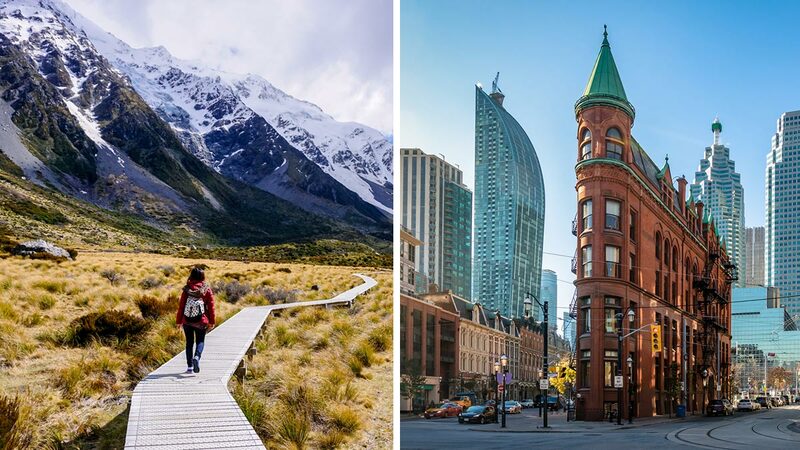 No wonder the Kiwis are so happy—with its soaring mountains, tranquil fjords, and picturesque rolling hills, the country is an absolutely beautiful place to live. We kid you not, we have seen Kiwis frolicking-frolicking-in the streets of Queenstown. We'd also like to give them a special mention for having the most user-friendly immigration site we've seen—all you have to do is input your home country and the reason for visiting, and the website will pull up all the different visa options available to you. The website also has its own points calculator. - You must be under 55 years old, with a score of at least 160 points. - You'll need to get your qualifications or educational attainment recognized to see how they align with the New Zealand Qualifications Framework, which ranks educational attainment levels from one to ten. - First, check if your university is on the list of Qualifications Exempt from Assessment. If it is, you can skip this step. - If you're given an invitation to apply, you need to submit and pay for your application within four months. We'd love to move to Australia for the flat whites and food scene alone. However, since the Land Down Under is looking to attract skilled immigrants to their less populated areas, living and working in major cities like Sydney, Melbourne, or Brisbane is off the table. - Work (including self-employment) in that same area for one year. 1) Submit an Expression of Interest (EOI) form through the Australian immigration website's SkillSelect. - At this stage, it's advisable to prepare documents supporting the claims you've made in your EOI. b) You're a barrister or solicitor, which means you'll have to obtain proof of admission to practice in the state you want to move to. - Once you receive the invitation, you must submit your application within 60 days. The requirements and options for where you can live will vary slightly depending on whether you've been sponsored by an eligible relative, or nominated by a state or territory government agency. - You may apply to live in a designated area. - Your job must be in the Medium and Long-term Strategic Skills List, and it must match the job descriptions on that list. - It generally includes occupations like accountants, engineers, auditors, surveyors, agricultural consultants and scientists, teachers (for nursery school, special needs, hearing or sight-impaired students), doctors and nurses, programmers, psychologists, social workers, chefs, technicians, mechanics, and construction workers. - You can apply to live in a regional or low-population-growth metropolitan area. - Your job must be in the Medium and Long-term Strategic Skills List or the Short-term Skilled Occupations List. Surprisingly, the short-term list includes just about every job under the sun. Oh Canada, the land of Justin Trudeau, maple syrup, and the nicest people on earth. If you'd like to live in one of the most gay-friendly countries in the world, you can do so by either applying for an Express Entry visa or joining the Atlantic Immigration Pilot. - This program was created to help attract skilled workers to Atlantic provinces like New Brunswick, Newfoundland and Labrador, Nova Scotia, and Prince Edward Island (yes, where Anne of Green Gables comes from). - The downside to this program is that it's employer-driven. That means you need to have a job offer from a business that is designated to participate in the pilot before you can apply. There's no list of approved employers hiring, so it's up to you to find one yourself. 1) Receive a job offer. 2) Make sure you meet the eligibility requirements, which vary depending on which program you're applying to. While you do need a job offer, it doesn't need to be the same occupation as your past work experience. So if your dream life in Canada involves switching careers, it's totally possible. 5) Once you get endorsed, you can apply for permanent residence. - You can apply for the Federal Skilled Workers Program, the Federal Skilled Trades Program, and the Canadian Experience Class. Your requirements will depend on which program you're applying to. - Your scores should be equivalent to Canadian Language Benchmark (CLB) 7 for all four abilities (reading, writing, speaking, listening). - an ECA report showing that your diploma from a foreign school is equivalent to a Canadian secondary or post-secondary diploma. You'll need to get a score of at least 67 out of 100 points to be included in the pool of candidates. Unlike federal workers, skilled tradesmen should already have a one-year full-time job offer or a certificate of qualification in their trade from a Canadian provincial or territorial authority. - Minor Group 633: butchers and bakers. While there's no educational requirement for this program, you can gain extra points if you have a diploma from a Canadian post-secondary school or a foreign diploma with an ECA report showing that it is equivalent to a Canadian post-secondary diploma. You will probably have to visit your desired province or territory to get assessed for your trade and get an employer in Canada to give you experience and training. Since the process differs depending on where you want to go, you should check the website of the state you want to live in. The list of links to each state website is at the bottom of this page. You can apply for this program if you've done 12 months of full-time (or the equivalent in part-time work) skilled work in Canada within the last three years. Your work should fall under NOC type 0, A, or B. As always, the work you've done should match the job description set out in the NOC as well. Just like the skilled trade program, Canadian Experience Class has no educational requirement, but you can gain extra points if you can present a Canadian secondary or post-secondary diploma, or an ECA report proving that your foreign qualifications are equivalent to a Canadian secondary or post-secondary degree. If your NOC level is 0 or A, your test scores should be equivalent to CLB 7. For NOC level B, your results should match CLB 5. 3) Invitations to apply will be sent to candidates with the highest scores. - If you're invited, you need to submit your requirements and settle your fees within 90 days.